Paul Aufiero is a man who desperately wants to be heard. Yet similar to individuals who pretend to listen in conversations while in fact waiting to speak, Paul Aufiero doesn't really care if anyone listens or connects with him in the scheme of things. Likewise, the fact that he chooses sports talk radio as his soapbox and an anonymous moniker of "Paul from Staten Island" is at once both extremely revealing and completely inconsequential. The anonymity is superfluous since Paul Aufiero is basically anonymous in his day-to-day life when the film begins, working in a toll-booth where wealthy creeps in luxury vehicles complain about a five dollar fee before condescendingly joking for him to have fun in his box. Moreover, even when Paul is literally out of the box, he decides to box himself in as soon as he gets off work by closing the door of his bedroom and delivering the cliche filled speeches he's carefully written out on notebook paper to anyone who happens to be tuning into the local AM sports radio station at two a.m. While this habit impresses his loyal friend and fellow obsessive devotee of the New York Giants, it keeps his elderly mother on the other side of the wall awake as she and his siblings constantly ask him when he's going to attempt to get a real job, plant roots, and grow out of the fan phase. 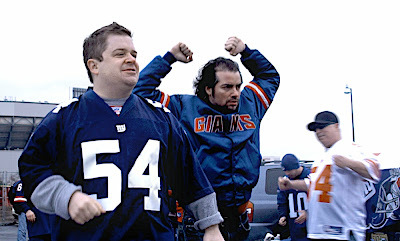 However, the ritual of the unquestionable pledge of allegiance to his team just serves to feed Paul's needs more than anything else to the point where he and his friend drive to the Giants stadium whenever there's a home game to hook their television up to their automobile and watch it from the parking lot. And ultimately while we in turn watch Wrestler screenwriter Robert Siegel's Sundance Film Festival Grand Jury Prize nominated work, we discover that football is beside the point in this cleverly existential indie which seems to have firm roots in what Taxi Driver and Raging Bull screenwriter Paul Schrader once described as "lonely man" cinema. 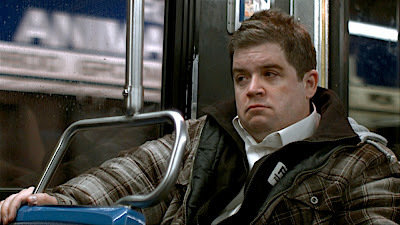 For indeed, in Patton Oswalt's heartbreakingly subtle yet delicately funny humanistic performance as Paul, it's understood that perhaps what our lead clings to more than the Giants or his favorite quarterback (whose poster is hung right by his pillow) is the need to believe in something else. As in engaging in irrational belief, by extension he can then believe in himself... even if it is only for the few precious moments he's granted air time on local radio. Unwilling to evaluate his irrational dedication to the team since it would then make him have to question himself as well, after Paul comes face to face with the man in his poster and events take an unexpectedly nasty turn, Paul is tested for the rest of the film's total eighty-five minute running time as to just how far his role as a "big fan" will go. 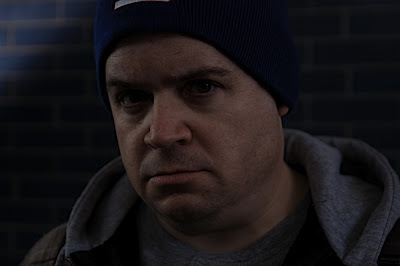 Thrust into the spotlight, Paul is no longer able to just revel in his anonymity and control his own actions on the radio when he's then confronted by family and strangers to act on what has happened to him. 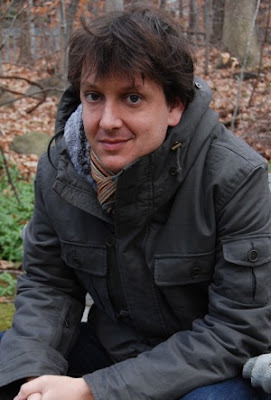 While it's easy to write off the film as being only of interest for sports nuts or football fans, as Siegel admitted to IndieWire, he's first and foremost a fan of Scorsese and '70s antihero works where change is never artificial as he revealed, "My favorite movie genre is gritty, funny, entertaining character studies about loner-misfit types who live in Queens or some other outer borough of New York." 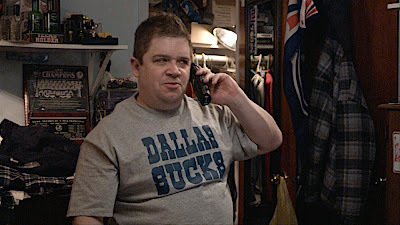 And sure enough when you replace football with any topic as Oswalt shared with The Onion, the film can apply to anyone. 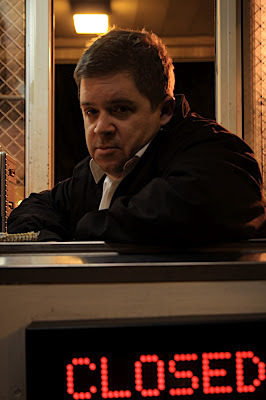 To this reviewer, it transformed into an allegory of obsessive behavior and the danger of tunnel vision as repeatedly Paul proves his commitment to his role as a "big fan." Likewise, as a big fan of the aforementioned filmmakers, in his feature filmmaking debut as a director, Siegel who taught himself the nuts and bolts of the cinematic process from Filmmaking for Dummies remains obsessively compelled to the truth and humanity of his '70s inspired screenplay. A stronger work than Wrestler since it's one that doesn't really follow a traditional three act paradigm by instead consisting of one major plot point (which has been shared far too carelessly in the trailer and numerous reviews), in the end its success is in our complete belief in Paul as a three dimensional human being which is as much of a credit to Siegel as it is to Oswalt. While it's a film that's sure to frustrate those wanting a more elaborate revenge scenario to occur since there's a pretty heavy Taxi Driver influence running throughout which is even evidenced in the trailer, Siegel never lets you forget that the film is first and foremost one centering on a man who just wants to be heard. 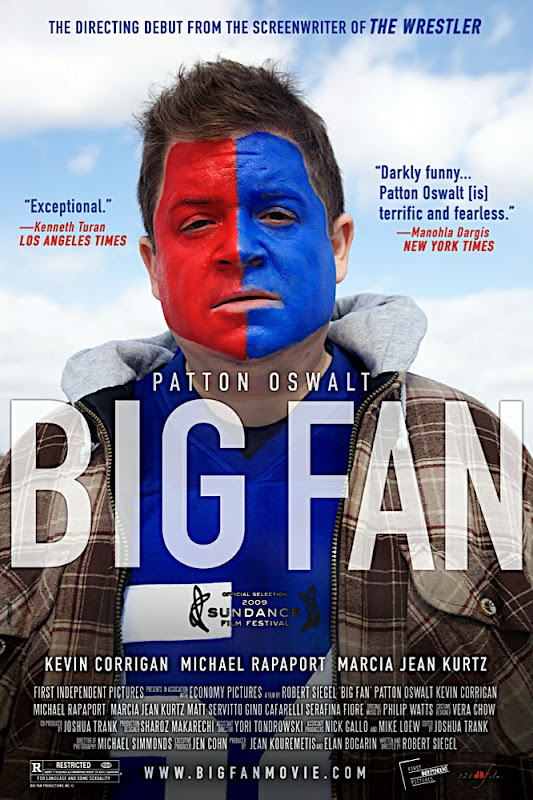 Although it's a basic need that's shared by all of us and one we manage to find endless outlets for in our daily lives in hopefully much healthier ways, in Siegel's movie, you have to dig beyond just the face paint and the jerseys to understand it's about the true heart beating beneath this particular fan onscreen. Ultimately the tragedy of Paul is that he is only comfortable when he can share something with strangers for two minutes or pin his hopes on more strangers on the field. Furthermore by espousing his own ridiculous dogma, we come to realize that he must believe that by never wavering, he will then have proven to himself that he is here, he is alive and that therefore he matters. And it's this idea in itself which makes Big Fan seem to move way beyond the arena of football to become a commentary of the times in which we're living. Indeed, despite having more opportunities than just the radio in which to interact, surely every single one of us has felt like an anonymous man in a box at one time or another just wanting to be heard, thereby making Siegel's sleeper film cut a little deeper emotionally than the literal sharp implements utilized in Darren Aronofsky's impressive Wrestler.